When someone asks you, outright, if you’re in love with them, what do you say? Super straightforward – guitar and vocal first, piano added after. I was aiming for a drumless mix and it turned out to be one of those rare songs that works equally well on piano and guitar. This song was fun to write and if you’ve seen it live you may well know the story because it’s one I love to tell – suffice to say that I lied when I told you I wasn’t in love, but darlin’ you lied to me too is a real-life extract and the song is about concealing the truth as much as telling it. I’ll admit to not having always acquitted myself well in matters of the heart; but sometimes writing a song can right a situation in your head and provide those words you needed at the time but failed to find, and for that reason I find singing this song immensely satisfying (and it’s also quite slushy in its way, which works). The bridge is one of my favourite to sing, it’s quite close to the top of my range and I remember writing it thinking it was a bit of risk (putting things together in the studio is a good time to take risks). There are good practical reasons for playing this one early in a live set as the bridge acts as a good barometer for how well my voice is warming up – the rest of it being fairly low and comfortable. I try to write to the edges of my range wherever possible (it’s not that far!) because I think you can get some really good emotional tension at the top end, or by slipping into falsetto at just the right point – for that reason there are songs that I wouldn’t be able to guarantee would work at the start of a set, but this isn’t one of them (I’m thinking Flowers maybe, or Wish These Years Away, or something like Daughters of Mercy). More likely to get played than not, it usually fits in the set somewhere. Premise: Well If you can hear it it’s probably in there… feminist anthem? anti-trumpist rallying cry? Love, understanding, empathy, kindness, are what’s needed to save the world and we should be bold and unreserved in their use. I wish I had some great story about how this song got written, or that I could even remember when it was or what I was doing at the time. I know it must have been at around the same time as Saving The Day because I was experimenting with circle-of-fifths ideas in both of them (loosely!) This was definitely an occasion where I felt smaller than the song, and didn’t feel like I always knew where it was going, but sometimes the songs come to us and through us and although we try to channel them we don’t always have a choice about what they say – just a choice to write them down or ignore them completely. I’m not generally a politically-motivated writer, which until recently I believed was because there was little, if anything, in our politics that was worth drawing attention to, and that even by writing about something you hate you become a mouthpiece for it or towards it or at it – net result that there is more of it in the world, not less. Braver, funnier and clever people than I do amazing jobs wielding songwriting to this end, and I am so grateful they do. I have my opinions, same as anyone, but my default stance is that I’m not really engaged enough or informed enough to comment publicly and anyway, I tend to retreat into a multi-dimensional internal and often imaginary world to counter what I find disappointing or uncontrollable on the outside. I believe that people can always keep trying to treat each other better, and it feels like we live in times where there is a stark choice and a determined effort to be made, to keep trying to be better, and to focus on what we have in common, when there are so many forces trying to pit us against each other. Anyway, I invented an imaginary army and called it Daughters of Mercy. Recording Process: Fairly straightforward, guitar + vocal, bowed and plucked double bass, and some strategically placed cymbal rolls. The set of these three mixes one after the other (Behind the Lines, Fire on the Mountain, Daughters of Mercy) was the strongest statement I could imagine making to start the album, musically and conceptually. The only occurrence of the word Beacon (well, Beacons) comes around in the final verse – the light theme continues, and here, too, light is a symbol for hope. De-tuned bottom note in the bass at 2:12. Coda section from 3:30 – putting those layers of vocals together was one of the most fun parts of the whole album for me. Premise: Fairy-tale princess gets kidnapped. Loosely inspired by the Beacons of Gondor scene from Lord of the Rings: The Return of the King. Recording Process: Another last-minute unlikely addition to the album, this one started out with a drop-D guitar part that I couldn’t play in its entirety (great start so far for the album with unfinished/impossible to play songs!) We cobbled the guitar together in sections and again I think there were some fairly incomplete lyrics that went along with it until quite near the end. It’s again down to the magic of the studio that there’s a complete song to show for this – listening back to it now the details on the guitar. This was the first of 3 songs I decided would benefit for a bit of piano treatment and maybe that’s when it really started to come together - because the piano line is incredibly satisfying to play. Then Dan added drums, lots of low toms and splashy cymbals, and I put the viola line on top – there is an instrumental draft version still up on Soundcloud here which I like at least as much as the sung version. The bottom note in the vocal line (holding on) is a bottom D! I was quite proud of that. I can’t get there in the normal course of things – I think you can hear from the recording that I’m pushing the limit of my range, but it’s amazing what warm-ups can do. Live: don’t know/can’t do it (haha!) but it was a lot of fun with the band! Recording Process: This was very nearly not a song at all, and very much an experiment in writing about something - war - that I know nothing about. 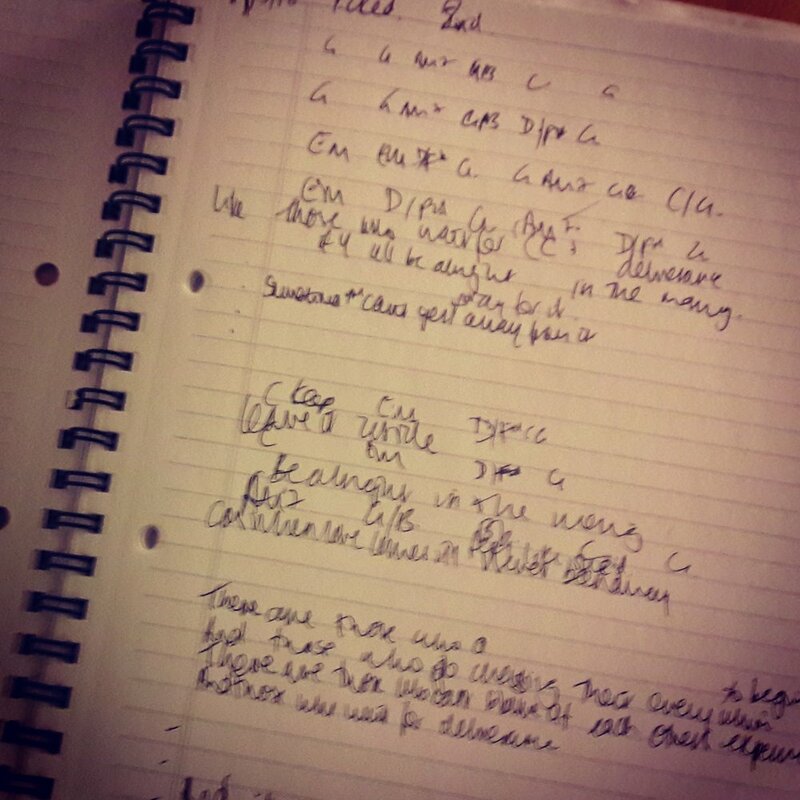 Usually I have a fairly settled idea about a song pretty quickly but my uncertainty over Behind The Lines meant it was hard to pin down - I’ve never had so many combinations of possible lyrics and parts of verses for a song before or since! It reminded me of writing poetry in school almost. In the end I related it back to something I do know something about: writing .The central idea of giving someone a book where you’ve written down all the things you’ve felt about them, for them to read and draw strength from when you’re far away – well that’s just the sort of thing I would do. Musically, I knew I wanted to do something unaccompanied or at least with no guitar, something that would foreground the vocal (don’t get me wrong, I love to play, but singing is the bit I live for) that could maybe be the album opener. I had unfinished fragments of Behind The Lines floating about quite late into the Beacon process – there’s no Half-Light version because it didn’t exist as a song at that point, and anyway it would have been just the vocal… might work, might not. On the day we went in to record Vicky’s bodhrán session she kindly played the rhythm along to a quickly cobbled-together guide track of mis-ordered lyrics and humming – almost as an experiment, but it was enough to give me hope that the song might eventually come together. We kept discussing it during the sessions that followed and Gareth talked about asking Russ to come in and drum, which he did, bringing an authentic WWII-era snare with him. I really feel like I owe Gareth a lot for getting taken up with this song and encouraging me to keep trying ideas lyrically and on the production – not sure I would have persevered with it on my own. I think the vocals went down next, and then we put the viola drones in, recording all the notes of the scale and bringing them in and out on the faders to make chords, until it ended up being the perfect atmospheric start to the album. Forever-reverb on the last note of the vocal at 3:47 onwards. Live: works well with just the bodhrán and harmonies, and Vicky’s been known to throw in the harmonies as well. At the launch night we had Maggie Smith put the drone in on her shruti box – it was the first song of the show and a brilliant feature to kick off with. 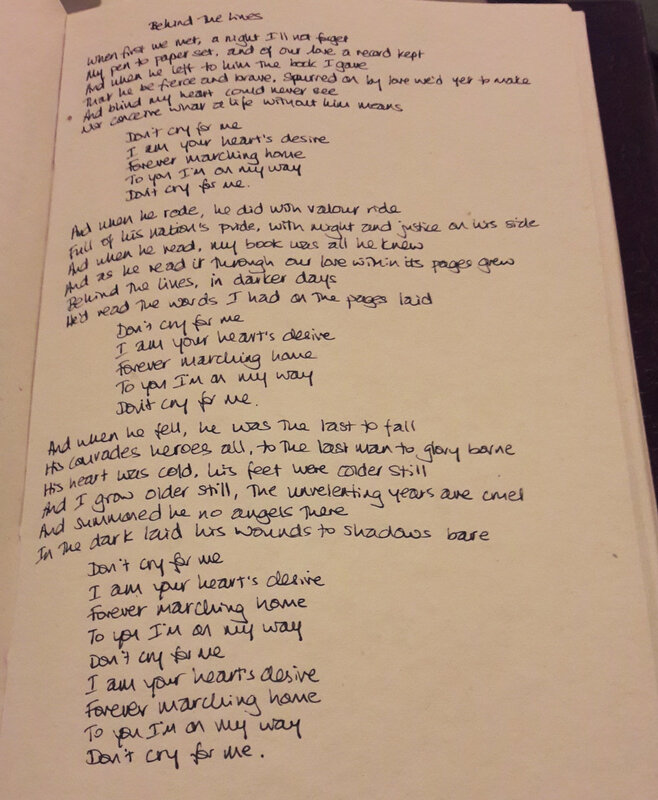 There’s now a video of the hand-written lyrics here. Beacon was released a year ago on Monday! Something I’ve been toying with (in between getting distracted by Scotland, France, Cornwall, and so on) is writing up a blog series on the stories behind the songs on Beacon and how they came about. This is something I’m tempted to do with every release to be honest, so I usually set it aside, but with Beacon it won’t quite go away - I think because there was so much more involved in its making, there is that much more to tell. I’ve worked on production before, for and with other people, but I think when it comes to your own material, as a songwriter there’s this extra dimension of suddenly having all these extra sounds to play with, but also the challenge of, how do I keep the sound true to myself, and communicate that to all the other people involved? I think also that something I’m becoming more aware of as I talk to people, is how listeners hear the songs can be so far tangential to where they actually came from and the real sources of inspiration behind them. Sometimes I agree this is better left well alone and the beauty of songs is that they can mean so many different things to different people - I remember reading something Seal was supposed to have said once, about not including lyrics in the album inserts because he’d rather people hear the words the way they wanted to. But I think for me, maybe the time has come that I do just need to talk about it all, a bit, so to coincide with the anniversary of the launch I’m make a start and see how it goes. There were also parts of the recording process and moments within the songs that were incredibly exciting and meaningful for me at the time, which I fear will be lost otherwise. It’s a chance to go back and listen to some of the tracks again with a bit more knowledge of what went into them. Father and daughter, Aidan and Vicky are friends I know for quite a while from the Croydon folk/folk and blues clubs - Ruskin House, Lime Meadow etc. They play together as a duo and in various other groups. Hilarity and high-energy abound. Vicky also played on the Doesn’t Take Much EP earlier in 2017. These are all fantastic musicians who I’ve met through folk clubs or different open mic circuits in central/south London - I think it says a lot about the complexity and wealth of the different live music scenes here that there was no overlap between anyone until we worked on this project. Gareth was the engineer, mixer and co-producer and it was his studio where we recorded Beacon and Half-light (not to mention These Hours as well). It was so great, after three years of having him work on my stripped-back acoustic projects, to finally have him play bass on Beacon. Russ was introduced via Gareth and the studio to add the military drumming on Behind The Lines. So that was the palette, and these were the people. We had wind, strings, percussion; a little bit of everything to gently embellish these songs and coax them out of their acoustic beginnings. Piano was recorded at Perryvale Studios just down the road. I wanted a choice of subtle accents rather than a uniform wall of production for this project and was quietly pleased that by accident all the songs came out with slightly different selections for the mix - a couple are just me on guitar plus vocals and harmonies, others have almost everyone on at once, and there’s just about every combination in between. It felt pretty obvious what most of the songs needed as we were going along, and while I suppose there’s always more you can do if you have the time, there wasn’t anything critical I felt missing from these mixes. What was interesting in hindsight, was working the songs up for the launch as an ensemble, and having various members add new things in and swap parts (or even play two parts at once!) - there’s no way we would have done that during the recording stage because the Beacon “band” such as it loosely is didn’t exist until after it was finished - but it’s great to see the songs continue to evolve. I’m going to be taking you on a tour through bits of the recording process (the bits I remember!) 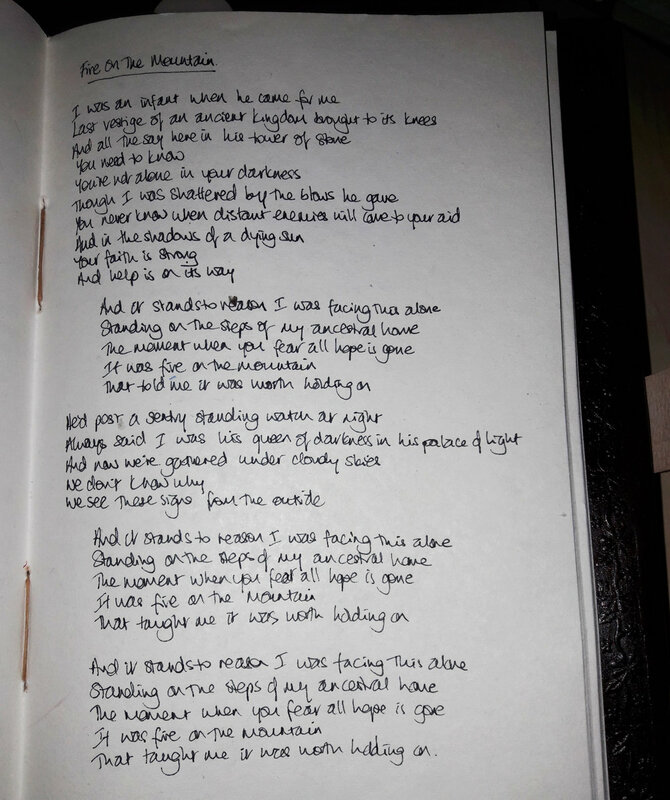 favourite lyrics, live notes and miscellaneous thoughts on the songs and generally feeling grateful for this project and to everyone who worked on it. Well... I have been writing, and it's been nice - no expectations at this stage, just sifting through the dross of my post-album mind and seeing whether anything sticks, it looks like one or two of them might; the simplest ones to write can be the most effective after all. (The quickest songs I've ever written aside from Dry-Eyed were Swim Any Sea and Wish These Years Away which are both live-set go-to staples now.) There was a time deep in the autumn last year buried in studio work on all those projects when I felt like I might never write again! but I expect that feeling is common enough. Creating the right time and atmosphere for writing is an art in itself. So many people say you should (though there is no should when it comes to creativity!) write first thing in the morning and capture those wisps of creative ideas that abound in your head as its in the process of waking... morning being a bit adventurous for my current schedule, I did at least sit down and write first thing yesterday and had a couple of good, workable ideas. Things have to change, writing-wise as with everything else. I realise now how much These Hours represents a very specific moment in my life, and as with Beacon revolves around two or three characters who were big influences on me at the time - it secretly amuses me to recall that all those different facets of emotion relate to only a couple of different people. Each album spans a period of about two years where songwriting was so heavily driven by my inability to communicate in real life - I have often feared that learning to open up too much might cause the song stream to run dry, but that seems not to be the case - though the songs are different. My life has taken several surprising turns, and yet most surprising of all is how settled it can feel amidst the changes, how bewilderment and wellbeing can both be so high at the same time, and how often I find myself looking about me with a fresh lens of gratitude.